There’s always a promise held somewhere in interactive theatre. There’s the idea, cherished by so many of its makers, that by making the audience physically active we’ll become activated in other ways as well. That by getting us on our feet and interacting with one another, we’ll be shaken out of our stupor and become – however briefly – part of the sort of utopian community that all theatre holds the fragile potential for. So much interactive theatre, though, has become lazy or cynical or both, trading on a label that suddenly has currency in the “experience economy” we now live in. Far too often, “interactive” (encased suspiciously in quotation marks) means little more than a marketing tick-box. Supposedly unique experiences are deeply derivative and being physically active becomes just another way of being mentally passive. In their ambitious new show, fanSHEN are attempting to recover some of that essential promise. 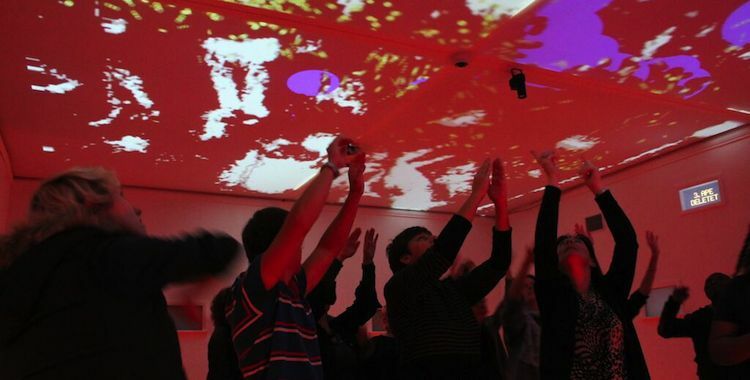 With no performers but a hefty load of technology, Invisible Treasure is experimenting with what it’s possible for people to do together in a space: how far they are willing to play and to work together, and when they will challenge authority. This is theatre that’s trying in some way to model how we interact in the world beyond these four walls; as the company’s description puts it, it is a world “that feels like the inside of a computer game but yet seems strangely similar to our own”. It is, as I say, ambitious. And for the moment, at least, fanSHEN fall short of those ambitions. They’ve saddled themselves with a Catch-22 of a project: to develop, Invisible Treasure needs testing with audiences, but that testing requires exposing it in a delicate, unfinished state. It’s still a work-in-progress, then, ironing out flaws and glitches along the way. Writing about it also feels like something of a work-in-progress – an unfinished response to an unfinished show. The computer game reference point in Invisible Treasure’s blurb is an apt one. Walking into the sleek white box of Cécile Trémolières’ design, all we have to go by is a single screen displaying cryptic instructions. It’s like a puzzle, but one that can only be collectively solved. There are lights, sounds and a colourful, textured floor, as well as a huge, ominous white rabbit looming in the corner (echoes of Alice in Wonderland as we plunge down the digital rabbit hole). A Big Brother-esque figure is watching and our actions as we progress through confusing levels can either please or displease him, as updates on the screen inform us. Audience involvement requires a careful framework, establishing parameters in which participants can exercise a degree of freedom. It might go against what fanSHEN are trying to do, but audience members – especially awkward, reserved, stereotypically British audience members (*raises hand*) – respond well to guidelines and limitations. As it currently exists, Invisible Treasure is just a bit too baffling and amorphous. Whether or not you choose to play by them, games need rules. The different levels here are often frustratingly opaque, and whether we progress by effort or by default is unclear. It’s hard to know what we are supposed to be achieving or resisting. That said, in certain moments the piece is skilful in coaxing its audience into involvement and cooperation. The simplicity of manoeuvring our bodies into shapes, reminiscent of school drama exercises, quickly gets everyone working together (if with mixed success). And I loved the dance sequence, in which we are all encouraged first in protective darkness and then in exposing light to boogie in a series of familiar styles (conclusion: I can’t line dance to save my life, but I love a bit of the twist). After puzzling (often unwittingly) our way through the show’s levels, though, the final reveal (SPOILER ALERT) feels a little unearned. That slightly terrifying rabbit cracks open down the middle and we step through the looking glass into a backstage space, all wires and controls. This is where fanSHEN really frame the intentions of the piece, but it feels like something of a shortcut. On the outside walls of the space we’ve just emerged from, questions are scrawled, asking us about cooperation and resistance both within and beyond the walls of the theatre. Pens invite our responses, but most answers speak of confusion – a common response to the show, it would seem. Part of the problem, perhaps, is that the complicated motion-sensor technology has eaten up much of fanSHEN’s development time, with the dramaturgy having to take a backseat. What the piece is trying to do – using interaction as a prompt to consider our interactions in the wider world and all of their political implications – is interesting and the set-up of the performance is intriguing, but as an experience it doesn’t yet cohere. Tensions that could be fascinating, such as that between the Big Brother element and the cooperation asked of us in each level, are currently just a bit awkward, while the directness of the questions we are issued with at the end feels as though it is making up for the lack of clarity elsewhere. There’s definitely something here, but it needs more time – and more audiences – to begin realising its ambitions.